Nick asked: With two outs, players on third and second. Batter hits a ground ball. Player on third reaches home safe BEFORE the batter gets even close to first base, WHEN the player on second gets tagged out. Thanks for your answer. Please explain the reason on why or why not. Rick answered: Nick, thank you for your question. The rule covering your situation is Rule 9 Scoring - Record Keeping Sec 1, How a Team Scores, Art. 1...A runner scores one run each time he legally advances to and touches first, second, third and then home plate before there are three outs to end the inning. Continuous action on this play begins when the batter hits the ground ball and becomes the batter/runner. 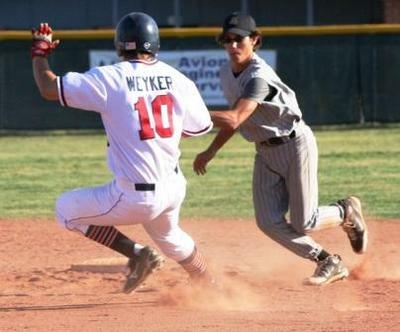 The runner from third reaches home plate before the batter/runner reaches first base; but in this case the batter/runner will not be the determining runner for the third out. That determination gets made on the runner from second, as the defense has concentrated their efforts to get that runner out. If the tag is made on the runner from second before the runner from third scored, that is the third out of the inning and the run does not score. If the tag is made after the runner from third scores, the run counts. If the tag on the runner from second is made after the batter/runner reaches first base, the run counts. The last scenario is the reason coaches instruct base runners not to run into a tag, so that the runner from third has an opportunity to score. Sounds like the ground ball must have been to the left side of the infield. The base runner has an opportunity to read the play and stay at second, forcing the infielder to make the more complicated throw across and subsequent catch by the first baseman. The other possiblity is the runner on second purposely gets into a rundown, attempting to avoid the putout until the runner from third is able to score. If the runner from second just runs into the out before the runner from third scores, it makes it easy on the defense. Comments for Does the run count? Batter flies out to deep RF. Runner on third tags up to score. Runner on first thinks there's two outs and begins running to second. Runner from third base crosses the plate as the ball is coming into the infield. The 2b sees the runner from first was running back to the base. He throws the ball and forces out the runner for not tagging up. Umpire initially counted the run, but then consulted with field ump and called the run "no good." Is this the proper use of the "force out" rule? IBases are loaded with 2 outs. If a batter is tagged out at home for the third out, do the three runs he batted in count? No even though play is "tag". It is still force out. He was forced to leave base he was on. It is a force play . Run does not count. So, if the final non-force tag is made BEFORE the batter/runner reaches first - the run doesn't count? That doesn't seem right. The 3rd out wasn't a force-out, and the defense ignored a potential "fourth-out" shouldn't the run count?